Farmers operate establishments that produce crops, livestock and dairy products. They harvest and sell their goods to produce markets and food companies both nationally and internationally. Farmers typically work long days, and some of the work can be physically strenuous. These professionals work outdoors with their hands in most kinds of weather. record financial, tax, production and employee information. Why did you choose this profession? I’ve always had a love of animals, so it made sense to work with horses. I decided to undertake Equine Studies at Elsenburg Agricultural Training Institute. What training did you undergo? I completed Agricultural: Module 1 and 2, then Certificate of Stable Yard Skills: Stage 1 and 2. I continued studying and completed Certificate of Horse Mastership: Module 3, and Certificate of Horse Mastership and Preliminary Riding Instruction: Module 4. In 2010, I completed my internship at Elsenburg to gain more experience. The staff there recognised my potential and offered me a position working at the stables. Is there a type of personality best suited to this work? You need to be open-minded and able to plan ahead when working with horses and students. Is experience as important as formal training? Yes, and no! For students who have previous experience and grew up with horses, the studies are often easy, but it can prove difficult to rid themselves of bad habits when they have not been taught the accurate techniques. I found my studies fascinating, difficult, but fun, which made it easier to acquire the correct techniques. Describe a typical day on the job My day starts at 8am, when I assist students with feeding horses and mucking out stables. I lecture students, according to a daily schedule, have lunch, and then conduct riding lessons. Once the day’s lessons are complete, lucern bales are distributed and stables are prepared for the horses coming in. I then feed the horses that are outside, and lock up. What do you like the most about your job? Training students to obtain their Eqasa qualification (through the Equestrian Qualifications Authority of Southern Africa). Which aspects are you least enthusiastic about? I’m not keen on working outside when it’s cold, muddy, wet and raining! What have been the highlights of your career to date? 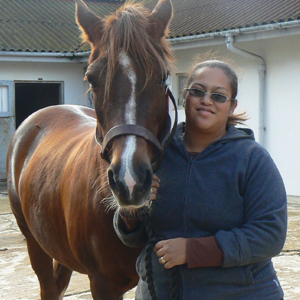 That I am the first woman of colour to obtain an Eqasa qualification; when a horse named Julian jumped 85 centimetres for the first time during my Module 4 exam; teaching and assisting grooms from various horse farms in gaining their qualifications. What are your goals for the future? To be teaching full-time, helping people obtain their Eqasa qualification. What advice would you give to someone starting out in your line of work? You must have a passion for horses and a lot of patience. It’s all about having fun and taking responsibility. If you know you have these characteristics, you’ll absolutely love your career. Describe your job in three words Fun, competitive, but hard (work)! Why did you choose to be a farmer? Because it is a business that offers an idyllic lifestyle in that one can be self-employed in an outdoor environment. What training did you undergo? I have a commercial and legal background which, although not essential, assists me in the business decisions required, coupled with the labour issues inherent, in employing and managing people. What traits make for a successful farmer? Farming requires one to be multi-skilled with a broad knowledge of business, agronomics, mechanics and veterinary. Good people skills and a command of the indigenous language spoken in the area are also important. Tolerance and patience are useful, particularly as one also has to deal with the inclement weather and prevailing market conditions, both of which are beyond one’s control. Yields, input costs and sales prices all have to be aligned in order to generate profit. Experience vs formal training? Experience is as important as formal training, along with the ability to glean information from other successful farmers, and business acumen. Describe a typical day on the job Having already planned activities such as application of fertilizer, chemicals, seeds, etc, the previous day, one has to ensure that farm work is carried out to the highest level, including meeting the appropriate production targets. What one doesn’t measure, one can’t manage. I have many administrative office duties to attend to as well including accounts, buying of inputs, wages, budgets, bankers, etc – as with any other business. What do you enjoy most about your work? Being self-employed and not being office bound. What aspects are you least keen on? Fires, climate, crime and the political insecurity of owning land in South Africa. What’s been the highlight to date? Being able to borrow money to grow my farming business. What are your future goals? To keep expanding, and to achieve economies of scale which ameliorate the diminishing farming profit margins. Advice for young farmers? Find a good mentor and follow your aspirations. Your job in three words Management, negotiation and capital investment. Primarily, farmers are trained through hands-on experience and are not required to do tertiary studies. However, degrees and diplomas in farming or agriculture are available, and are an advantage when looking for a position in the field. Aspiring farmers can learn through apprenticeships or by being supervised and trained by experienced farmers. Experience of working on a farm, for example from a weekend or holiday job, dairy work or crop picking would be useful.